195 N. Front St. Braidwood, IL. Booth will be located in the City of Braidwood's Rt. 66 Red Carpet Corridor Arts & Craft Show area in the Rt. 66 Park. Our club holds broom sales annually as part of our fundraising efforts. House, heavy duty and whisk brooms are among the choices for sale. We hold broom sales in front of local businesses, at flea markets and other community events. House brooms are good for kitchens, hardwood floors and patios. Heavy duty or shop brooms are a good fit in garages, sheds and workshops. Whisk brooms come in handy for those smaller jobs, work benches and to clean up after the larger brooms have piled up the dirt and debris. Brooms can be ordered throughout the year by calling (815)791-8093. 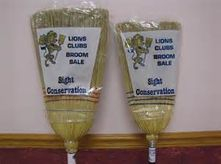 Many residents know that when they buy a Lions broom, it will last a long time. Brooms can be delivered free of charge in the Braidwood area if requested. All proceeds from the sales benefit our club's sight & sound humanitarian services as well as the various community activities which we provide or sponsor throughout the year. Due to the cost of shipping & freight we are unable to ship our brooms. We are only able to do local pick up & delivery to the Braidwood area. Braidwood Lions Club Copyright © 2010 - 2018. All rights reserved.